And from Turkey. The thing about Anadols though is that they weren't as crappy as you might think. And just look at those whitewalls! Starsky and Hutch had nothing on this with their Ford. Turkey's domestic car manufacturer introduced the world's first fiberglass station wagon in 1973. 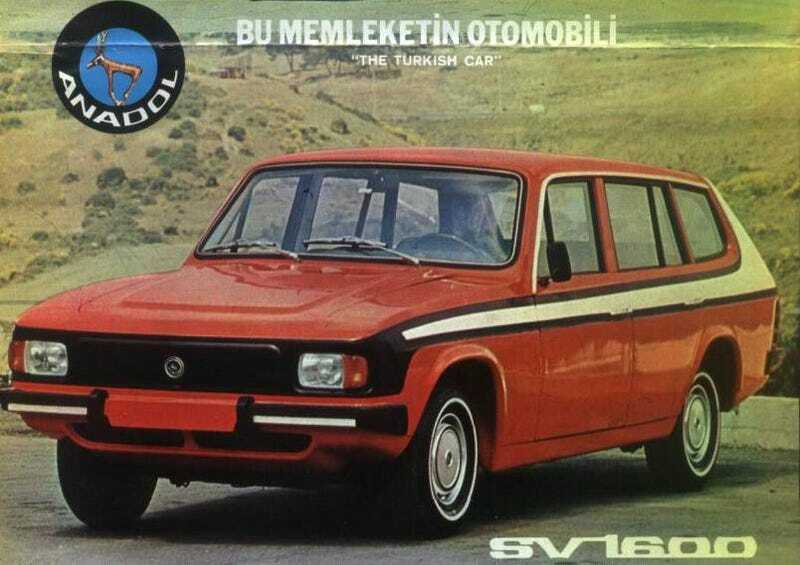 The SV-1600 looked completely different than Anadol's 4-door sedans and was designed with the help of Britain's composite maestros, Reliant, just like the rest of the lineup. A sporty three-door station wagon, to be exact. And what a car the NSU P10 was! The British origins meant it came powered by 1.6 Ford Kent OHV engine linked to a manual gearbox, while the 5-seat body fiberglass body was affixed to an H-frame chassis. It had independent front coil spring suspension at the front and a live axle with leaf springs at the back. The steering was modern rack and pinion, the brakes were servo-assisted with discs/drums and on the inside, Turkish customers enjoyed a pair of Smith gauges, the practicality of foldable rear-seats and the unmistakable smell of vaporizing dissolvents. Starsky and Hutch came out in the US in 1975, and at least one photo of their Ford Gran Torino had to make it to Turkey straight away (through Britain perhaps), because in 1976, the SV-1600 was upgraded with such luxuries as sporty alloy wheels, a new steering wheel, new side mirrors and the option of black-and-white stripes painted on the sides exactly like on that Gran Torino in the TV. While parent company Otosan offered a car with a body that had "infinitive life in all natural conditions" in its brochures, the SV-1600's career ended in 1981 after they built almost 6,500 units. Its successor, the A8-16 sedan was much less popular and Otosan discontinued the Anadol passenger cars in 1986. Today, the factory assembles Ford commercial vehicles.